NusaBay Menjangan is one of those delightful places you come across and you want to tell everyone about, but then hesitate as you also want to keep it to yourself. The resort is only accessible by boat, there are no cars and the only scooters are used by the park rangers, so it is uber-quiet, romantic and oh, so peaceful, it is the ideal place to spend a few of days of snorkelling, exploring and generally chilling out. Alan and I first visited NusaBay Menjangan in March 2016 and couldn’t resist going back on our last visit to Bali. To be honest, we are not really resort people and tend to prefer to be independent, but as the resort is well spaced out and private, it feels very un-resorty! 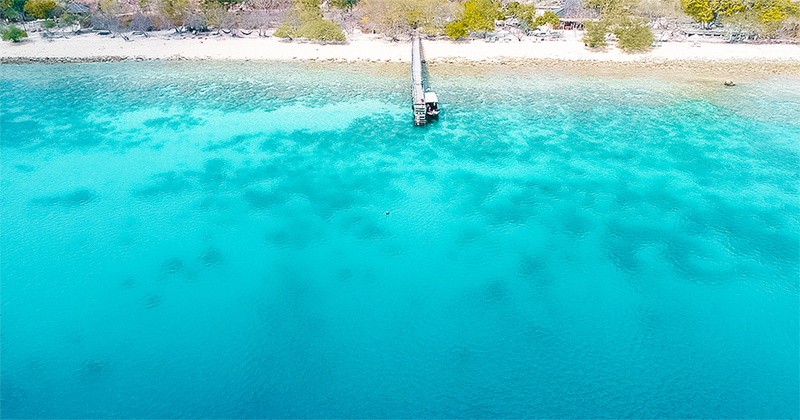 NusaBay Menjangan is only accessible by their private boat which collects you from Labuan Lalang in the north-west of the island and takes you the 20-minute ride over the clear turquoise waters to the resort on the edge of the West Bali National Park. Lanai Cottage No. 14 was our home for our stay and I must say it was pretty perfect. The cottages are all built in Balinese style with a light, airy, spacious bedrooms with a fabulous canopied king-sized bed you just want to throw yourself on and luxuriate! 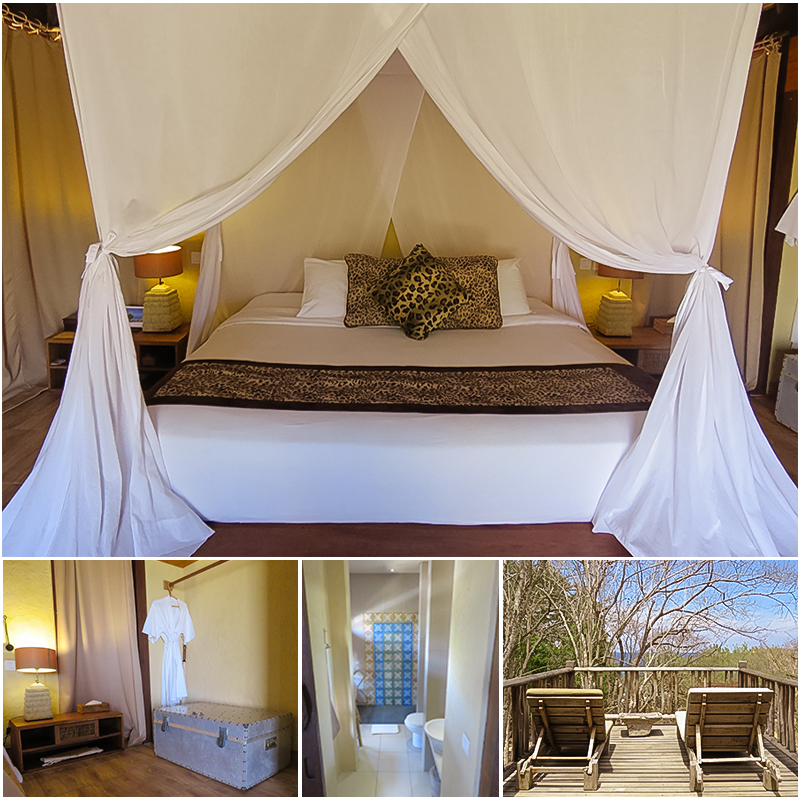 The colours are muted: whites, creams, and natural with animal prints thrown in to remind you that you are near the jungle, all very relaxing. I loved the bamboo rail and hangers and the silver metal trunk for storing our luggage. The bathroom with buff tiled walls and large shower was light and airy, was secreted behind a sliding door to the side of the bedroom. As well as the mosquito nets surrounding the bed, there is also a mosquito spiral to burn, though we found we didn’t need it. The room also has air-conditioning, an electronic safety box, bathrobes and slippers. The private balcony out the front has two reclining sunbeds for relaxing, soaking up the sun and watching the world go by. 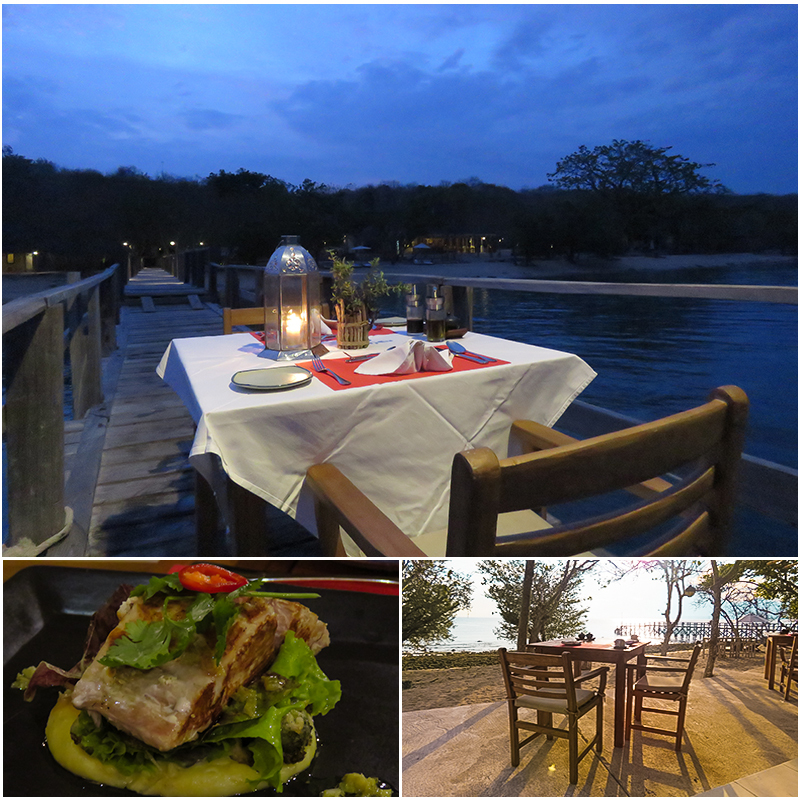 The open-air restaurant overlooks the beach and it is so peaceful to hear the lapping of the waves in the background. The breakfast poses a problem, should I have a Continental, Vegan or American, or even an Indonesian Breakfast? Everything on the menu sounds delicious, but finally, I went for the Healthy Breakfast with fresh fruit, yoghurt, egg white omelette and a baker’s basket of a choice of breads. It doesn’t get any easier for lunch and dinner with mouthwatering salads, fish and meat dishes. Vegetarians and vegans are catered for too. For a special occasion, a private table on the beach or at the end of the jetty can be arranged. The resort is well laid out with two private villas which sleep 4 and have their own area of private beach and 14 lanai cottages. Near the Reception in the middle of the resort, is the semi-circular pool with sun loungers, the towels are laid out for you, so you don’t have to bring them from your cottage. Nearby is the Library Lounge, perfect for chilling out and reading or catching up on your emails or surfing on the two computers. Spoil yourself with a relaxing massage – yes, I drifted off within 5 minutes – a manicure, pedicure, facial or even reflexology in the Spa and Beauty Salon. As you are in the National Park, you are surrounded by nature. 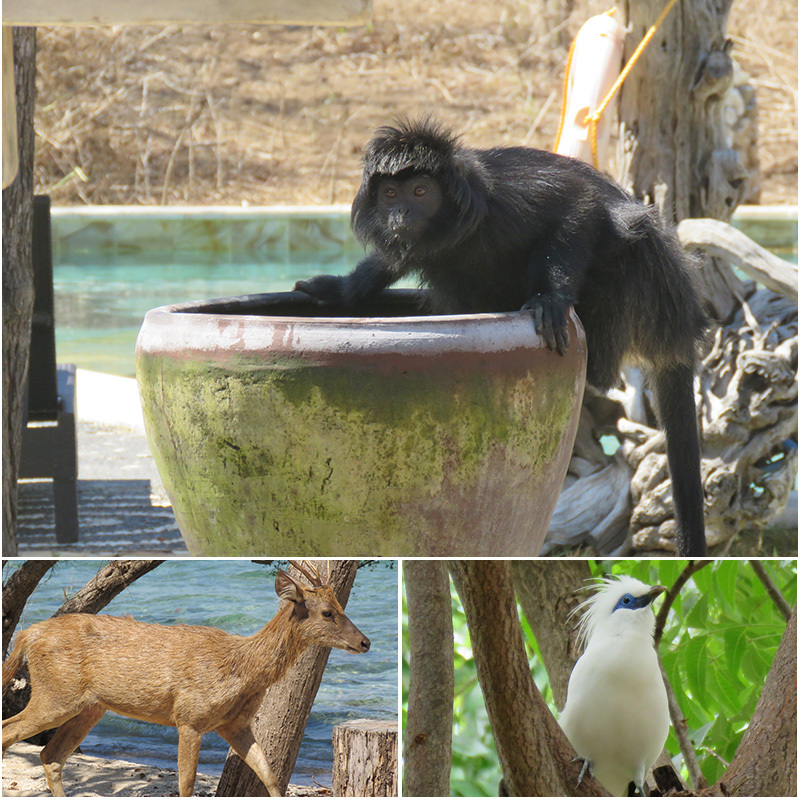 You will see black-faced monkeys swinging in the trees and sitting on the walls. One of the more unusual sights is the elegant wild deer who tiptoe through the resort and sit on the beach. You also might be lucky enough to see some of the indigenous Bali starlings, beautiful white birds with blue around their eyes. 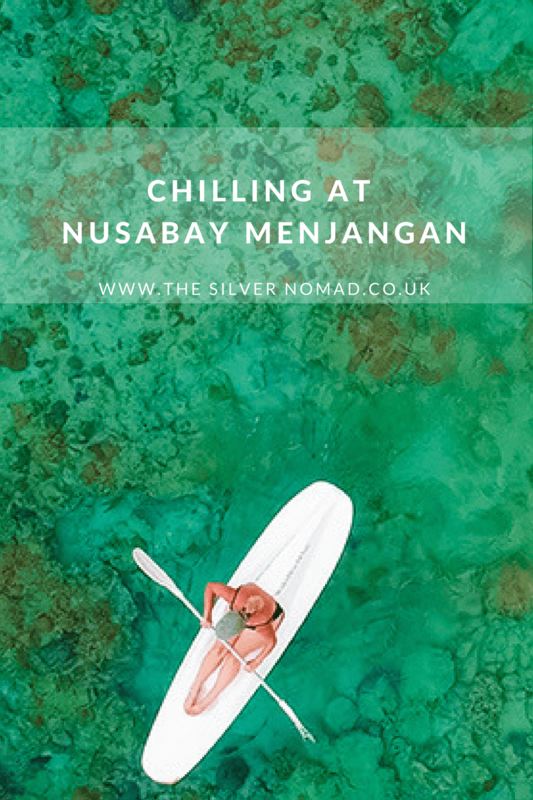 So what can you do with your time at the NusaBay Menjangan? We took out the canoes and paddled along the coastline, taking time to drift and watch the fish in the clear waters. Maybe go for a mountain bike tour through the forest taking in the beauty of the mangroves and looking out for wildlife on the way? Or take the early morning or afternoon trek into the National Park. You will learn about the conservation projects in the park and find fossils of corals high up in the hills from when the island was submerged as well as possibly seeing monitor lizards and other wildlife. If diving is your thing, you can snorkel or dive over at Menjangan Island with its 7 world class diving sites teeming with tropical fish and coral reef, shelves and deep walls. This post about NusaBay Menjangan was created in collaboration with Waka Hotels and Resorts. NusaBay Menjangan is the perfect place to chill when you are in north Bali. Hi Larch WOW I loved reading your post on this amazing part of Bali. Your photos are brilliant and this post has really reminded me that I MUST get back to Bali. Thank you so much. Bali is a beautiful island and NusaBay Menjangan is such a special place, I hope you get to visit soon!